Part of the joy of being a wildlife gardener is to observe the interaction of wildlife with the plants that we grow. Plants are used by animals in many different ways but in this section we will focus on the special relationship between flowering plants and their insect visitors, what we collectively call ‘pollinators’. Most people think first of honeybees as pollinators, but there are many more insect pollinators including bumblebees, solitary bees, some wasps, hoverflies, most butterflies and moths, and even some beetles. Collectively, these other species are probably more important pollinators, and the honeybee is an introduced species to Britain. It probably originated in Africa, and before its arrival our native wildflowers managed without it. 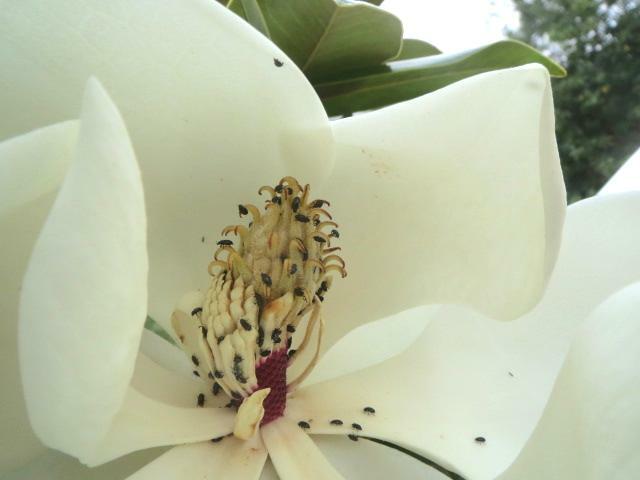 These tiny beetles swarming over a Magnolia grandiflora flower are the pollinators for this very primitive plant. It is a common assumption that that only ‘wild’ or ‘native’ plants in gardens can support pollinating insects, but as you can find on our page Gardens: native and non-native species , the evidence does not support it. Herbaceous borders, herb gardens and cottage gardens can be full of bees, hoverflies and butterflies without recourse to any ‘native’ species of flowers at all. The insects have no knowledge of whether flowers are classified as “native” or “cultivated” by gardeners and naturalists. Their priority is simply to find energy-rich, accessible food as quickly and efficiently as possible, and many kinds of ‘non-native’ flowers serve this purpose just as well as, or better than, ‘native’ flowers, provided their flowers are accessible as described in our leaflet “Background to Pollination and Pollinators” which gives much more information about pollination, and the adaptation of insects to different shapes of flowers. A typical cottage garden or herbaceous border will have flowers of many shapes to suit different insects, and it is a rewarding exercise to study each type of flower and see what kind of insects it will attract. It follows that to provide forage for a wide range of insects you need to plant a diverse range of flowers of different shapes and sizes. Add to this the fact that you need to provide forage across the whole season from spring to autumn by planting a succession of flowers. It saves visiting insects valuable time if large stands or groups of the same species are planted, as they can focus on exploiting one kind and do not have to learn to access a series of different flowers. 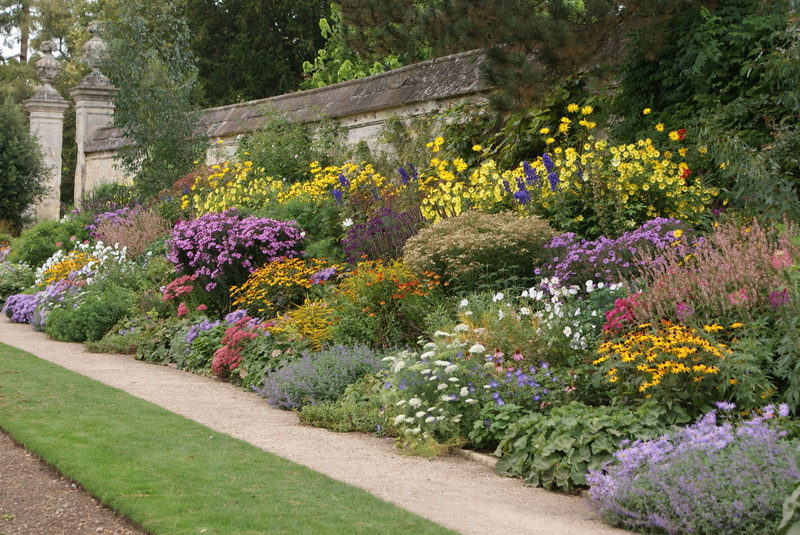 We can't all aspire to such a scale of planting, but this flower border at the Oxford Botanic Garden combines great beauty with an excellent pollinator resource. Good plant choice and use is one of the best ways to maximise our gardens for pollinating insects, and here are some simple tips. “Double” or flora pleno flowers have been bred so that most, or all, of the reproductive parts of the flower have been converted into extra petals, so are useless for pollinators. “Cactus” and “Pompom” Dahlias are classic examples of double flowers that are of little or no use to insects, while ‘single-flowered’ Dahlias such as “Bishop of Llandaff” or the “Coltness Hybrids” are good late season food sources for bumblebees and butterflies. If you notice that certain types of flower in your garden are attracting plenty of pollinating insects, plant more of them, and when visiting other gardens, make a note of particular varieties that are attracting lots of insects, and include them in your own planting plan. When visiting garden centres and nurseries where varieties of plants are grouped together, note which varieties are being visited by bees and butterflies on the sales stands, which will be the ones they really favour. Few highly-bred bedding plants like petunias and busy lizzies offer useful forage for insects, being bred for effect rather. Bedding plants such as have had a lot attention from plant breeders, but this has been at the expense of their value to insects as a source of nectar or pollen. Almost all culinary herbs, if left to flower, are very attractive to insects. Ensure a good number of your bee, butterfly or pollinator plants are in full sun and in a sheltered place, and try to plant in large swathes or blocks, rather than dotting single plants in isolation. Grow a range of plants to offer pollen and nectar throughout the year such as foxgloves, perennial wallflower Erysimum ‘Bowles Mauve’ or Phacelia tanacetifolia. 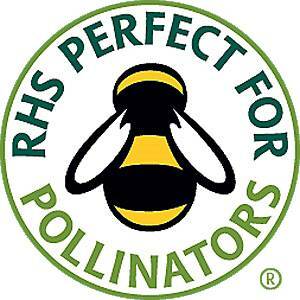 Look out for bee-friendly or pollinator-friendly symbols on plant labels at garden centres or consult more extensive plant lists and advice. Bird pollinated exotics (see the accompanying leaflet) are not usually any value for insect pollinators, but there are some exceptions. Honey bees and social wasps have been seen nectar robbing the long red tubular flowers of Lobelia tupa (left), and there are some cultivars of New Zealand flax Phormium and red hot poker Kniphophia which are exceptions to the general principle and are regularly visited by bumblebees. If you notice bees using these cultivars when you are visiting a garden or nursery, then these are ones to choose if you want to grow these exotic-looking and architectural plants in your own garden and still provide forage for insects. It would seem an easy job to compile a list of plants that attract insects to the garden, but there are as many different lists as there are books and web sites on wildlife gardening. Most are largely based on personal observation and anecdote, and although they can be helpful they cannot be taken as definitive. There are many inconsistencies between such lists, and we cannot at this stage recommend any single list on its own, some for example are aimed at one type of pollinator, such as the honey bee. The Wildlife Gardening Forum will be making up our own lists, as far as possible based on evidence and consensus, and will be looking to wildlife gardeners to help. To be most useful. lists should take make allowance for where the garden is located, and the soil conditions. 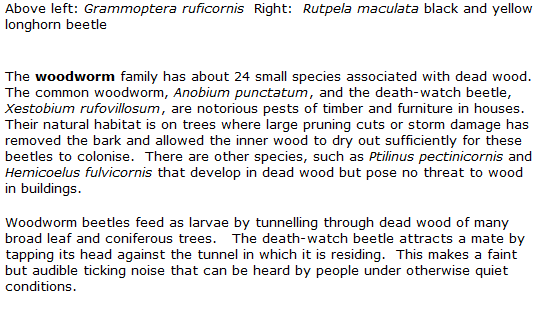 A good example of a local list is that prepared by Jan Miller and Marc Carlton for the Welsh Pollinator Taskforce. Even if you are not a ‘plantaholic’ who collects a particular genus such as Rosa or Clematis, you could, through observation and recording of insect visits, work out which cultivars have flowers that offer good nutritional rewards to insects, and which kinds of insects in particular they attract. There are still large gaps in our knowledge of the value to insects of specific cultivars, and there may well be a role for home gardeners here to do a bit of ‘citizen science’. Bird pollinated exotics (see the accompanying leaflet) are not usually any value for insect pollinators, but there are some exceptions. 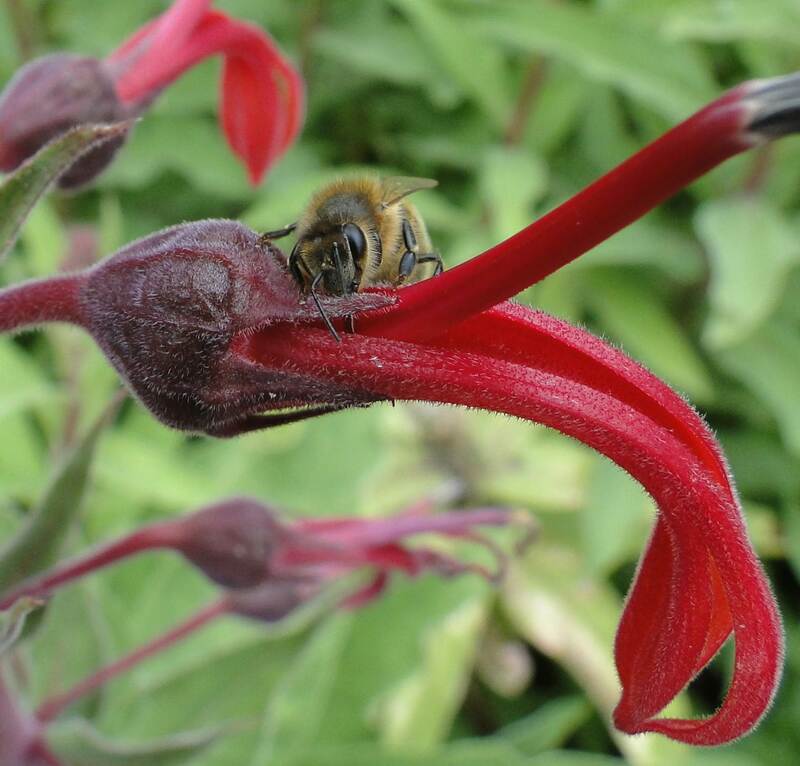 Honey bees and social wasps have been seen nectar robbing the long red tubular flowers of Lobelia tupa (left), and there are some cultivars of New Zealand flax Phormium and red hot poker Kniphophia which are exceptions to the general principle and are regularly visited by bumblebees.